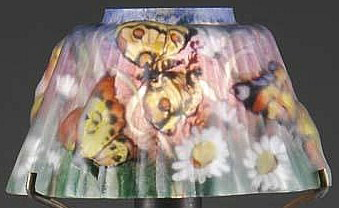 This is certainly one of the nicer Pairpoint lamp shades. It is known as a Balmoral shade. The defining features here are the limited puffy areas and the wavy form of the shade. Please notice that the top of the shade has a large open area.